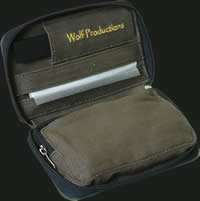 As with all in the range, the S2 holds a flexi rolling aid & papers dispenser in the lid. It's extra zippable pocket holds a tobacco pouch / small grinder & other accessories (lighter, roach etc) Ideal for the smoker on the move. Reversable for extra storage.